Personetics, the leading provider of customer-facing AI solution for financial services, is revealing the industry’s first Self-Driving Finance™ platform. Self-Driving Finance offers a novel way to simplify financial decision-making – using AI to safely and effortlessly guide consumers and businesses towards their financial goals. Using Self-Driving Finance capabilities, banks are able to provide retail, small business and wealth management customers with varying degrees of guidance in managing their finances, ranging from real-time insights to personalized recommendations and automated money management. A recent report published by the World Economic Forum (WEF) points to the major impact Self-Driving Finance will have on the way financial services connect with customers and compete for their loyalty. As past methods of differentiation erode, AI presents an opportunity for institutions to escape a race to the bottom in price competition by introducing new ways to distinguish themselves to customers. Future customer experiences will be centered on AI, which will automate much of customers’ financial lives and improve their financial outcome. Self-driving finance, the report predicts, will upend existing competitive dynamics, pushing returns to the customer experience owner while commoditizing all other providers. Self-Driving Finance is aiming to fill a gaping hole in customers’ financial lives. As many as 57% of Americans struggle financially, according to research by the Center for Financial Services Innovation (CFSI). They expect more help from their financial services providers – three in five consumers say banks are failing to keep up with their need. This expectations gap is a threat to customer loyalty: according to an EY survey, only 27% of customers view their bank as the first place they would turn to for anything to do with their finances. Yet banks are ill-equipped to meet these customer needs today. As the WEF report states, current online and offline channels have limited ability to provide insights to customers on their financial habits and the impact of those habits on their future financial wellbeing, leading customers to make suboptimal decisions that are detrimental to financial health. Like self-driving cars, Self-Driving Finance is not an all or nothing proposition but rather a multi-level framework with increasing degrees of autonomous capabilities. Each level provides a foundation for more advanced capabilities that can be added to the bank’s offering. Data (Level 0): transaction categorization and account aggregation provide an integrated view of the customer’s financial history. Insights (Level 1): adding a layer of analytics to highlight exceptions and important events. Advice (Level 2): moving from descriptive to prescriptive analytics, just-in-time advice is offered to help customers manage their day-to-day finances. 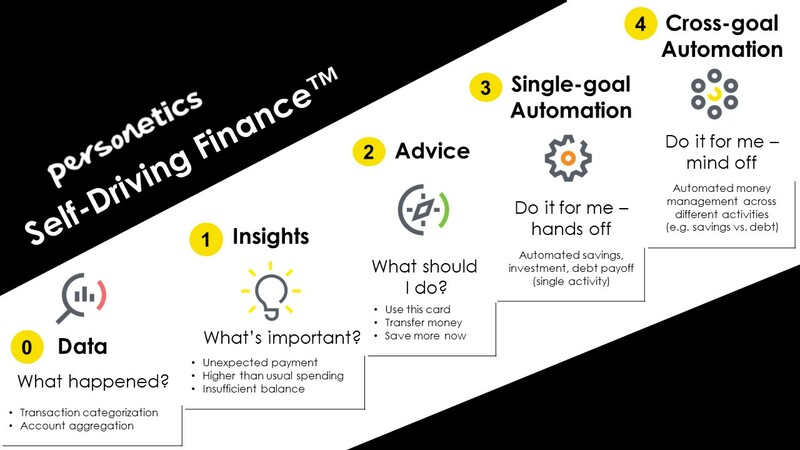 Single-goal Automation (Level 3): focused on a specific goal, automated money management makes it easier for customers to save more, increase their investment funds, or pay off their debt. Cross-goal Automation (Level 4): the ultimate level of Self-Driving Finance automates decisions that involve multiple options for improving the customer’s financial wellbeing, including cashflow management and allocation of funds towards various financial goals.